A circular arena with a myriad of weapons strewn throughout its area. With no mechanical or environmental hazards, this arena instead provides ample weaponry and ammunition to competitors who fight in it. While occupying this arena, C-rank catalog weapons of any Weapon Style are always considered within reach, as are E-rank shuriken, senbon, and kunai projectiles also matching those found in the weapon catalog, though contestants are limited to the use of one such weapon, or three such projectiles per post. Bau would stand there hunched over the walking stick he always carried with him. His long green robes with white patterns hanging on his shoulders. His clothing was a slightly stained but baggy green shirt and pants. Even the sword on his hip was old and worn. Sealed away either by time or on purpose. It would take a feat of strength to draw it an even then it would barely be of any use. His wooden sandals rested in the strong soil. 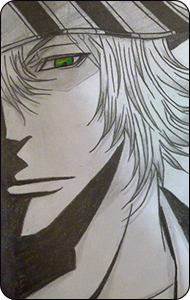 Stiff under his feet as emerald eyes peered out from behind a green and white striped hat and long white hair. His free hand scratching at the white stubble around his chin. He had begun to wonder if they knew more about his past than he thought. After all looking over all of this, it was like a graveyard for warriors. The fallen back home burned and then their graves marked with their weapons. As far as the eye could see this place seemed to be spotted with them. Any weapon he could think of was here. Such violence it begged for. However he knew these weapons were a danger. He had used them before in war and had seen the end result they always caused. He had been raised up on one side of this plateau from the waiting area beneath. The arena itself didn't seem so limitless now on a second glance. A circle about fifty meters from wall to wall if his guess was right. Moving around was limited by the strewn out weapons seemingly random. His eyes shifted to the sound of another platform being brought up about twenty five meters away. Dozens of weapons between him and his opponent. If they were a ranged type he was already at a disadvantage. Still the intercom would blare to life a moment before an announcer would announce them in order of which they came. By name and by village association. Interesting that bit. Still it told him nothing of the opponent. After all this name of theirs would only benefit those of a local nature. He had lived his life in a different land. Still the announcer would finish introducing them and announce the match would begin. Bau would lean his weight upon his stick a little more before nodding to his opponent. Not making any move to charge through this mess of weaponry underfoot. Official Ruling wrote: Sachihiro is not present.